Don Lewis grew up in Grey, Saskatchewan and grew up hanging out at the curling rink. Don started curling in High School while attending Balfour Tech in Regina. In 1954 curling third with Skip Doug McVety they lost the Provincial High School Final to the Bayne Secord rink out of Saskatoon. The Secord rink went on to win the first of their two Canadian High School Championships. During the early 1960’s Don continued to curl. He curled in numerous bonspiels sometimes curling as many as 250 games in a season including three or four Southern Men’s playdowns. One of the highlights was winning the Regina Bonspiel Grand Aggregate with a 15 and 0 record. A feat that Don does not think has ever been matched. 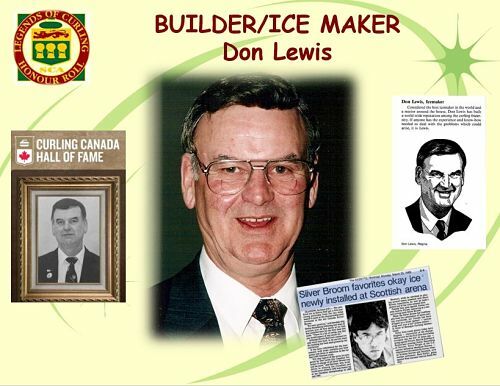 However, it was making ice not curling on it where Don Lewis would truly make his mark. Don began his ice making career helping out at the rink. Later on, a group of 22 Saskatchewan curlers traveled east to the Toronto area to teach the game of curling and the art of making curling ice. On his return he began making ice at the Tartan Curling Club. He traveled back to Ontario to put curling ice into Maple Leaf Gardens for a curling event. Don went on to become the Ice Maker for the World Championships in 1972 and for the Brier in 1976. He was head ice maker at 14 Briers and 18 World Championships before retiring in 1990. He was also one of the originators of the Curl Canada Ice Technicians Course. During this time Don was also manager of the Tartan Club, a position he held for 12 years. Don was not finished yet; he decided to move into the Boardroom. He became President of the Tartan Club in 1980. 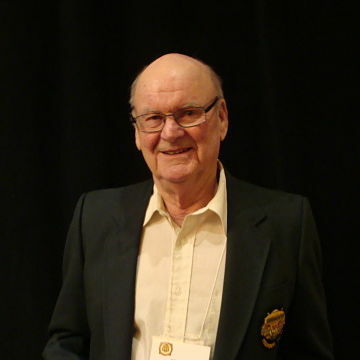 In 1982 he was elected to the Board of Directors of the Saskatchewan Curling Association and served as its President during the 1990-91 Curling Season. Don then decided to make the next step and was elected to the Board of the Canadian Curling Association in 1996 and was elected its President in 2001. Don also found time to serve as the Chair of the 1992 Brier in Regina. In 1989 Don was honoured with a major award by the Canadian Curling Association. Up until then awards were presented in five different categories. Don was awarded the Ice Technician of the Year award, the very first to be honoured in that category. That same year he was inducted into the Canadian Curling Hall of Fame in the Builder Category.